The Soviets developed 5.45x39mm cartridge as a replacement for the 7.62x39mm, as the world trend shifted from larger, heavier bullets to smaller, lighter projectiles that enable the soldier to carry twice the amount of ammo as before at the same weight. The 53 grain bullet is clad in gilding metal and features a steel core. This ammo is Berdan-primed and was initially intended for military use. The velocity of a 53 grain FMJ round of 5.45x39mm is 2,887 f/s. The AK-74 assault rifle is chambered in 5.45x39mm and ballistics test showed that a pronounced tumbling effect is expected in tissue. 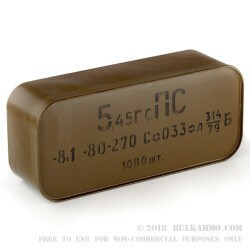 Pick up this military surplus ammo with its signature military issue Soviet spam can today. This is a rare piece of Eastern European history that won't last forever! If you have a need for this ammo better buy now since obama made it illegal to import there will be no more. I don't know how bulkammo did it but l ordered at 4:30 pm Fri. and received it Sat. Morning. That's less than 24 hrs. Weird Markings on the Spam Can of 5.45x39 ammunition I recieved? A: Hello CJ, This ammunition does contain corrosive primers. Q: Is this 7n6 ammo? What kind of surplus ammo is this? A: Hello Andy, This ammunition is not 7N6 but is loaded with a standard 53 grain round featuring a mild steel core.